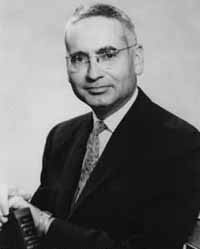 Alvin Martin Weinberg was a nuclear physicist and administrator at Oak Ridge National Laboratory (ORNL). He came to Oak Ridge, Tennessee in 1945 and remained there until his death in 2006. Weinberg was born April 20th, 1915 in Chicago, Illinois. He received his Ph.D. from the University of Chicago in mathematical biophysics in 1939. He then worked at the Metallurgical Laboratory at the University of Chicago until the war intervened. He then went to work at a newly formed laboratory in Oak Ridge, Tennessee. He served as director of Oak Ridge National Laboratory's Physics Division from 1945 until 1948, when he became Research Director for the laboratory. He was named director of the laboratory in 1955. Weinberg often sat in the front row at ORNL division information meetings and ask the first, often a very penetrating, question after each scientific talk. For young scientists giving their first presentation, the experience could be frightening but was also exciting and stimulating. When asked how he found the time to attend every meeting, Weinberg replied jokingly, "We didn't have a DOE in those days." Weinberg had the Materials Testing Reactor converted into a mock-up of a real reactor called the Low Intensity Test Reactor (LITR), or the "Poor Man's Pile." Experiments at the LITR led to the design of both pressurized-water and boiling-water nuclear reactors, which have since become the dominant reactor types in commercial nuclear power plants. In the late 1940s Weinberg asked ORNL's reactor engineers to design a reactor using fluid fuel instead of solid fuel. This Homogeneous Reactor Experiment (HRE) was affectionately dubbed "Alvin's 3P reactor" because it required a pot, a pipe, and a pump. The HRE went into operation in 1950 and at the criticality party Weinberg brought the appropriate spirits: "When piles go critical in Chicago, we celebrate with wine. When piles go critical in Tennessee, we celebrate with Jack Daniel's." The HRE operated for 105 days before it was closed down. Weinberg even invited Senator Jack Kennedy and Senator Albert Gore, Sr. to visit the reactor, but to no avail. Nevertheless, information was still gained from operation of the HRE. Weinberg's next project, the Molten Salt Reactor Experiment, set a record for continuous operation and was the first to use uranium-233 as fuel. It was known as the "chemist's reactor" because so many of the problems which cropped up were chemical ones. Under Weinberg's tenure as director, ORNL's Biology Division grew to five times the size of the next largest division. This division was charged with understanding how ionizing radiation interacts with living things and to try and find ways to help them survive radiation damage, such as bone marrow transplants. In the 1960s Weinberg He also pursued new missions for ORNL, such as using nuclear energy to desalinate seawater. He recruited Philip Hammond from Los Alamos to further this mission and in 1970 started the first big ecology project in the United States: the National Science Foundation-Research Applied to National Needs Environmental Program. In 1958 Weinberg published The Physical Theory of Neutron Chain Reactors with Nobel Laureate Eugene Wigner. It was destined to become a classic in the field. He was elected president of the American Nuclear Society in 1959 and began service on President's Science Advisory Committee the following year. In 1965 he was appointed vice president of the Union Carbide Corporation's Nuclear Division. Weinberg retired from ORNL in 1973 after 18 years as the lab's director. Weinberg was named director of the U.S. Office of Energy Research and Development in Washington, D.C. in 1974. The following year he founded and became the first director of Institute for Energy Analysis at Oak Ridge Associated Universities (ORAU). This institute focused on evaluating alternatives for meeting future energy requirements. From 1976 to 1984, the Institute for Energy Analysis was a center for study of diverse issues related to carbon dioxide and global climate. Weinberg worked at ORAU until retiring to become an ORAU distinguished fellow in 1985. Weinberg remained active in retirement. In 1992 he was named chairman of the International Friendship Bell Committee, which arranged for the installation of a Japanese bell in Oak Ridge. He also called for strengthening of the International Atomic Energy Agency and systems to defend against nuclear weapons.